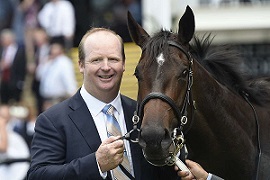 The moniker of ‘Golden Slipper winning trainer’ has given Gary Portelli the confidence to set out a game plan for Time To Reign and stick to it. Sure the plan has taken some hits along the way, with a couple of shock defeats, but the Warwick Farm trainer believes the pendulum is swinging back to his colt ahead of Saturday’s $3.5m Longines Golden Slipper Stakes (1200m). Of course, the colt is a half-brother to Portelli’s 2017 Slipper winner She Will Reign. Portelli has long said Time To Reign isn’t the natural that his older sibling was so had to work out a way to find out if he could emulate her. So here’s ‘the plan’ according to Gary Portelli. “The plan was to get going early, get qualified before Christmas. Ticked that box,’’ he said. “To come back and win first-up at Warwick Farm and that didn't quite go to plan. “We were hoping to take on Tassort second-up fit (in the Silver Slipper) and that way we'd see where we were in the pecking order. “When we beat him we're pretty confident we had the horse to win the Slipper. "Then he comes out on a dry track and gets beaten (in the Todman), emotions are all over the place. A lot of trainers will insist their youngsters, particularly the potentially valuable colts, aren’t simply wet trackers. Portelli hasn’t quite gone that far with Time To Reign but as his comments illustrate he sees a soft to heavy track as an advantage to his colt. And drawing nine is ideal. As far as his defeat in the Todman goes, Portelli was initially downcast but with reflection and some wise counsel has concluded it was no reason to throw the toys out of the cot. “I spoke to Dominic Beirne after the Silver Slipper and he said the rating was so high when he beat Tassort that he can't peak again, he'll have to put in a flat run,’’ Portelli said. “I think horses racing on heavy tracks coming back to fast tracks, they just don't win. It's the other way around. Time To Reign has been one of several TAB favourites at one point in the build up to Saturday’s race but the Todman defeat saw him deposed and he’s a $13 chance. Portelli said the colt has pleased him with his work this week, he scooted 1000m on Tuesday on his own and attacked the line to the trainer’s liking. “I basically mimicked the whole preparation of She Will Reign. Work, the whole thing,’’ he said. “The fact I've won it once gives you the confidence to make decisions. That year I thought it was my race to lose, this year I feel like it's my race to win.